The government's food guide pyramid would provide consumers with a formula to personalize their diets based on how much they exercise, their age, gender, weight and height under a new proposal by the Agriculture Department. 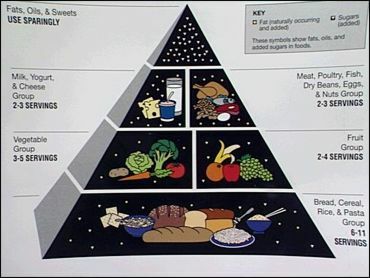 Eric Hentges, executive director of the department's Center for Nutrition Policy and Promotion, said Tuesday that the agency's proposed revision for the pyramid would for the first time help consumers tailor their diets to address their own special needs. The department also wants to focus its effort to promote healthy eating habits primarily at obese and overweight consumers, he said, noting that they now make up more than 60 percent of the population. "The bottom line is we've got to do something to get a behavioral change," Hentges said. "Everyone recognizes that we do have issues regarding caloric consumption." The proposal, to be published Thursday, is the first phase in the government's effort to make a new graphic or update the food pyramid, along with nutritional brochures and other educational materials. The food guide pyramid is a tool intended to help Americans eat well. Schools rely on it, along with the federal dietary guidelines, for planning lunches. Recently, the White House Office of Management and Budget told the department to update its well-known graphic and dietary guidelines. The new proposal marks the first time the pyramid will be revised since it was developed in 1992. The guidelines, revised every five years, also are being updated. Hentges said some of the pyramid's basic recommendations will remain the same. Consumers still will be encouraged to limit total fat intake to just 30 percent of all their calories and saturated fat to less than 10 percent. They should eat just 300 milligrams or less of cholesterol, and 2,400 milligrams of sodium and can eat some added sugars as long as they don't exceed their caloric intake. The department plans to meet recommendations by the White House budget office to discourage consumers from eating trans fatty acids, which are found in many baked and fried goods and can be harmful for the heart. At the same time, consumers will be encouraged to eat foods that are high in omega-3 fats such as fish. USDA also is working with the Health and Human Services Department on changes to the dietary guidelines. An advisory panel will discuss proposals at a meeting this month.